Tattoos are permanent and last a lifetime. They can be motifs, symbols, designs or combinations of letters. They are sported by both men and women alike. 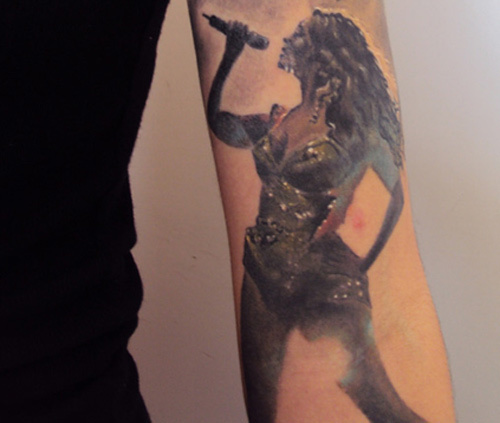 Fans often worship their celebrities to the extent that they get their images tattooed on their body. This is a hug commitment that lasts a lifetime. Beyoncé Giselle Knowles-Carter, popularly known as Beyoncé, is a singer, song writer, activist and actress. 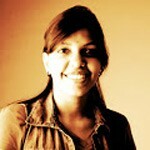 In 2013, she was included in the Time magazine’s list of the 100 most influential people in the world. Having the autograph of your favorite celebrity as a tattoo on your arm is very unique. 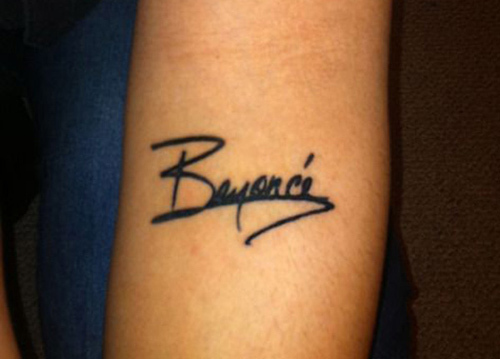 Beyonce’s signature is very attractive and a hot favorite among fans. 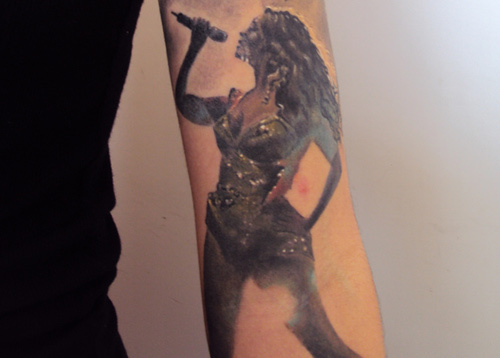 This tattoo is in black ink and is a perfect replica of her autograph. It looks very attractive. This tattoo is in black and white. 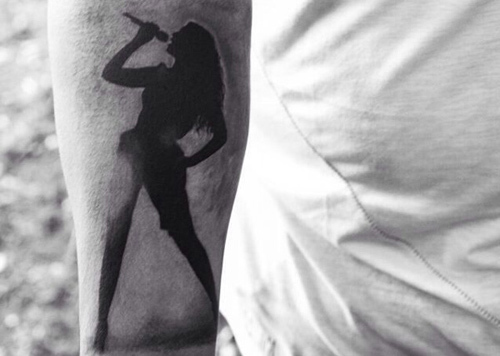 It shows the silhouette of Beyonce . She is shown with her head thrown back, and her hair curly and prominent. She is holding a mic in her hand and is singing into it. She is standing with her legs apart wearing heels. This tattoo is in color. It shows half of Beyonce’s face, from below her hairline. Her eyes are painted brown and shaded to make it look life like. Her lips are painted red and shaded to make them look glossy. Her hair is short and is tucked behind her ear. This tattoo is also in color. Like the previous one, it shows half her face. Her cheeks are painted pink and her lips are a deep pink. Her eye shadow is highlighted and her cheeks are made glossy by adding white ink. Her hair is light brown and wavy. 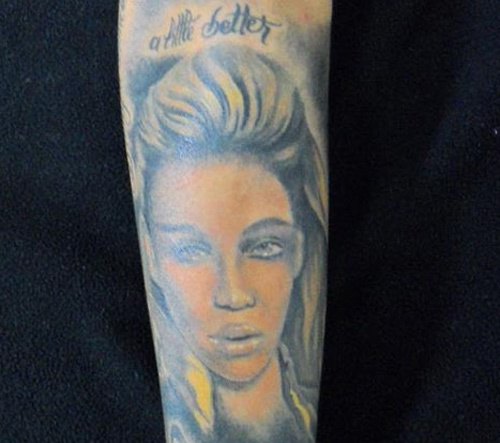 Her eyebrows are thin.This tattoo is suited for the arm or the leg. This tattoo is in dark colors with glitter. It shows Beyonce in a body suit, singing. She is holding the mic up and her head is tilted back. Her hair is curly and runs to her waist. The tattoo is in dark colors, but not a silhouette in black, the suit can be seen well and the detailing is done with various shades of dark ink. This tattoo is in dark colors. 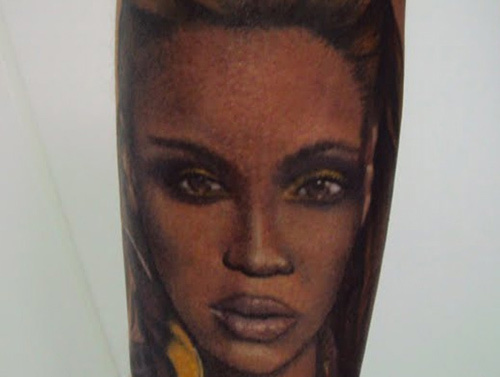 It shows Beyonce’s full face. Her hair is a dark blonde color. Her eyes are prominent and her lips are glossy. The top part of it contains a gramophone in black and white. The lower part contains Beyonce’s laughing face. 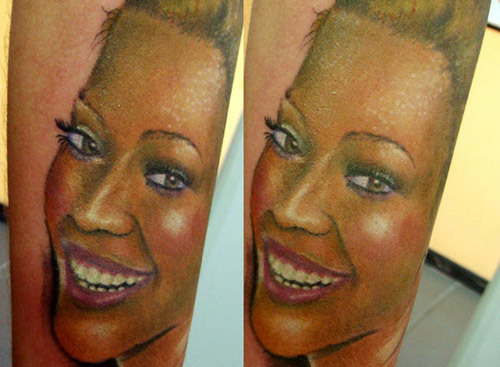 This tattoo shows Beyonce’s face in full color. Below it is a mini gramophone in black ink. Under it is an inscription in cursive that says, “I was here”. Above the face is an inscription that says, “A little better”. Tattoos are permanent and absolute certainty of wanting them is very important. Many can be of easy influence, so join a community to stay cautious and shape your tattoo designs.